Prime Minister Yousuf Raza Gilani has been declared ineligible by the Supreme Court of Pakistan in contempt of court case, setting aside speaker ruling of the National Assembly Speaker Fehmida Mirza. Mr Gilani will no more be a member of parliament following the verdict. 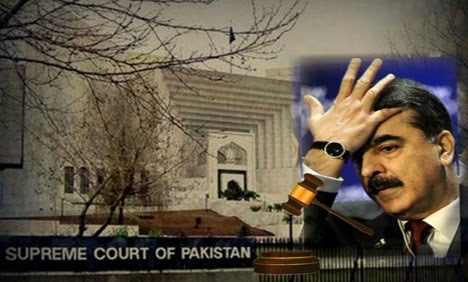 The court said the office of the prime minister fell vacant from April 26, when he was convicted by the seven member bench of apex court for not implementing court orders of writing letter to Swiss authorities to reopen graft cases against President Asif Ali Zardari. Identical petitions were submitted by Imran Khan and Khwaja Muhammad Asif in the Supreme Court against the speaker ruling. A three-member bench of the apex court headed by Chief Justice of Pakistan Iftikhar Muhammad Chaudhry announced the verdict against Mr Gilani. 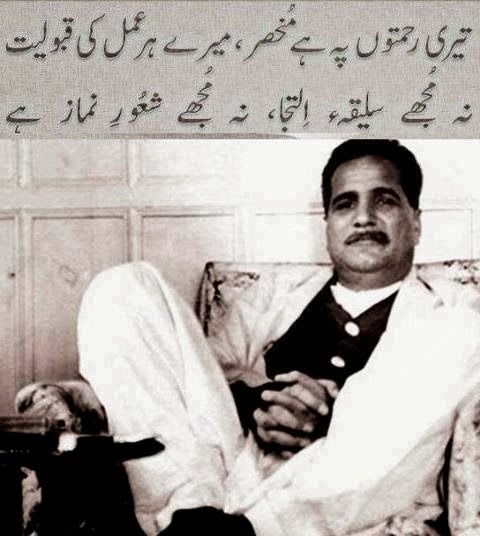 To many Pakistani's this will be pleased to get rid of the least capable and puppet like Prime Minister. We are also hoping that the next PM will write letter to Swiss authorities soon after joining the office. 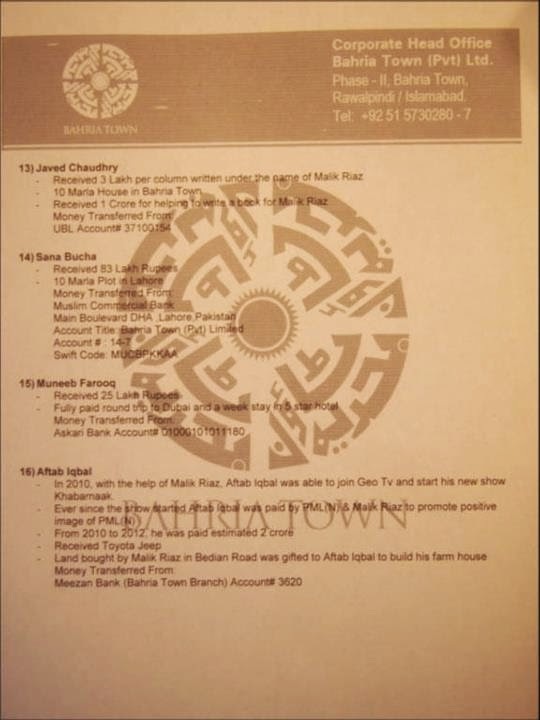 A list of 19 journalists accused of taking money, plots and other favors from Malik Riaz has also surfaced on internet. 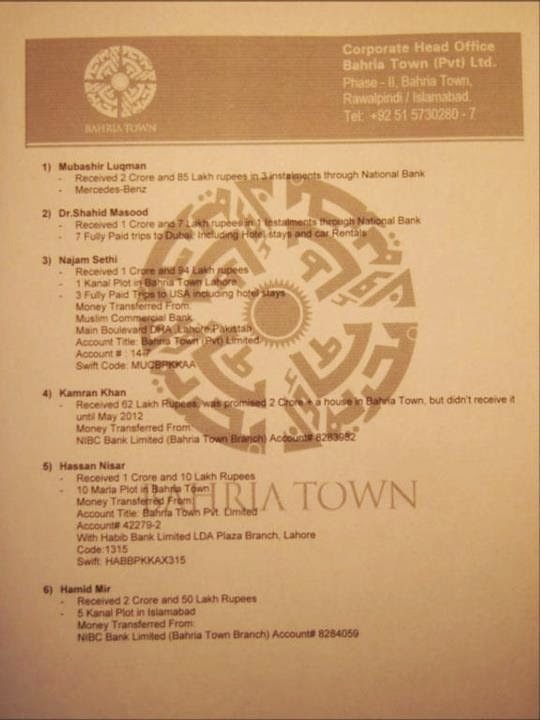 This list is printed on letter head of Bahria Town and contains names of Mubashir Lucman, Shahid Masood, Najam Sethi, Kamran Khan, Hassan Nisar, Hamid Mir, Mazhar Abbas, Meher Bukhari, Marvi Sermid, Arshad Sharif, Nusrat Javed, Mushtaq Minhas, Javed Chaudhry, Sana Bucha, Muneeb Farooq, Aftab Iqbal, Sohail Waraich, Asma Sherazi and Sami Ibrahim. Most of these are senior journalists with huge fan-following and people of Pakistan believe what these journalists say. This list questions the authenticity of the reports and analysis done by these journalists. Anyone listening to these anchors and journalists should think twice before believing anything said by these scumbags. 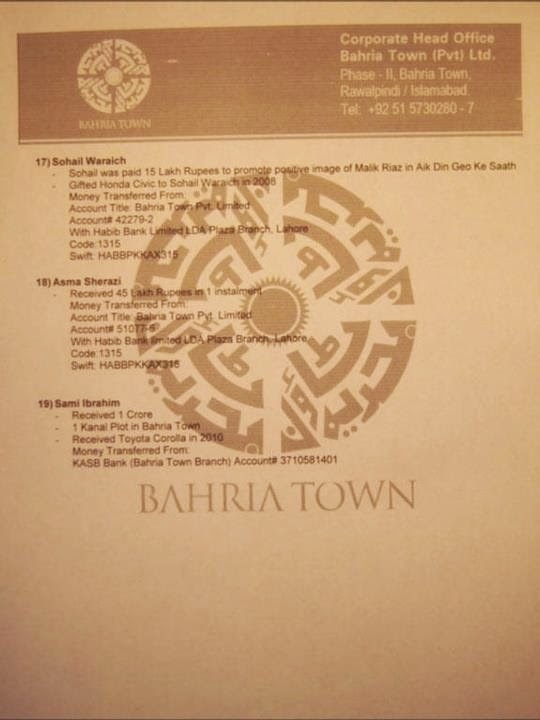 Business tycoon and ex-CEO of Bahria Town, Malik Riaz's allegations on Arsalan Iftikhar, son of Chief Justice Iftikhar Muhammad Chaudhry is becoming a complex conspiracy with every passing day. 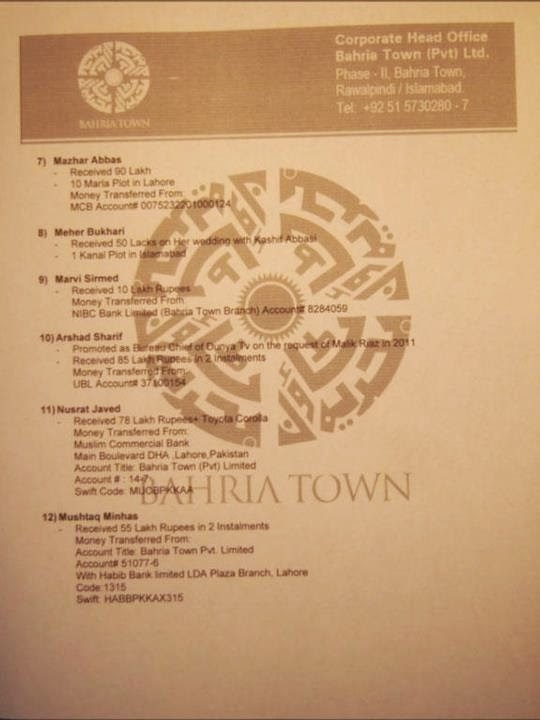 Arsalan Iftikhar allegedly blackmailed Malik Riaz and took money from Malik Riaz's son in law. There are stories of how Malik Riaz paid for the expensive foreign trips of Arsalan Iftikhar to get favors from Supreme Court in return. These stories were shared with few journalists and when it became public, SC took suo moto notice of it. 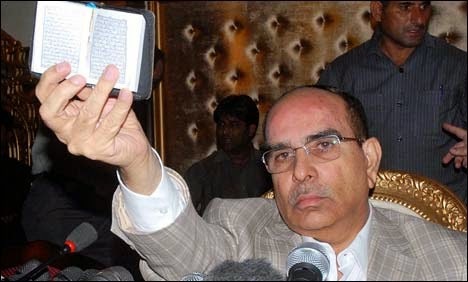 Malik Riaz was summoned in Supreme Court, who after appearing in the court, held a press conference in which he accused CJ, his son, serving judges and many other people of having knowledge of the story forehand. Serious allegations were put on the judiciary and SC took suo moto again. And now another fresh chapter of the conspiracy unfolds when a leaked video surfaced on the social video site, Youtube, showing two anchors, Mubashir Lucman and Mehar Bukhari, of Dunya TV scripting the questions and answers for Malik Riaz. During the video Mubashir Lucman received a call from Abdul Qadir Gilani, son of Yousaf Raza Gilani, Prime Minister of Pakistan. Mubashir after speaking to him passed the phone to Malik Riaz who chatted with him for a while. It was also claimed that Mehar Bukhari received a text from Maryam Nawaz Sharif stating that they were offered a bullet proof car by the tycoon but the offer was declined by the Sharif family. A call from the owner of the Dunya TV was received during the video in which he instructed the anchors to go over-time if required and do not interrupt the guest. Supreme Court has taken a suo moto notice of the leaked video and has summoned record of Off-Air clip from PEMRA. CJ also asked PEMRA Chairman about the role of PEMRA and media regulatory framework. PEMRA Chairman said that the channels which violate law are issued notices and actions are taken when complaints are received. SC has now directed Attorney General to pursue a case against Malik Riaz, Arsalan Iftikhar and Salman Ali who might have committed illegal acts and should be brought to book with the full force and rigour of the law. To me one of the benefits that PPP government took from the timing of this case was to camouflage the MEMO GATE case. Most of Pakistani's are unaware that Mr. Hussain Haqqani is found guilty in the case but no hype was created because our media was feeding the transmissions related to Malik Riaz. Everyday loads of information is placed over the world wide web (www) by individuals, companies, universities and governments from all around the globe. Though this provides convenience but it give a bigger chance to hackers who are always trying to steal information and use it for their criminal activities. These hackers are findings new ways to steal our information or damage our online existence. In Pakistan, we have seen attacks on websites of universities, government bodies and businesses. To protect ourselves from such attacks, we have to be aware and well informed of the ways to hide and secure our information from such thieves. Cyber Secure Pakistan Conference held on 17th May at Marriott Hotel, Islamabad was centered around the same theme. 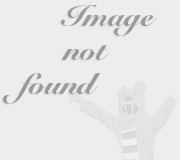 The event was organized by UltraSpectra (Pvt.) Ltd. in association with Pakistan Information Security Association (PISA). The sponsors included Google, MovingMinds, Trachulas, NIMS, TheExpertsCloud, KasperSky, Interactive Group and National ICT R&D Fund. Media Partners of the Event included ProPakistani, mustakbil.com, CIO Pakistan, FM 91 and shashca.com, Pakistan Telecommunications Authority (PTA) also supported this event. Even though late start of the event, Generic topics selection by speakers were displeasing factors but overall it was a good effort by the organizing team and gave a chance to individuals and companies to network with others.